First, application. Are the painters using spray/brush or roll. Know if they are going to spray. For the interior this can achieve a glassier surface and will require masking unprotected areas. On rougher exterior surfaces, like rough sawn siding, usually only if necessary will contactors “back brush” or "back roll" to actually work the material into below the surface for a more complete seal. Actually a great number of new homes receive spray coats, that could of lasted longer had they been back brushed, but keep in mind that this is simply not the norm and requires much more on the labor side of things. Address the areas that need to be scraped and primed (as well as for worn or exposed areas). Contrary to opinion, primer is not just "watered down" paint as seen by some and primer does have the design of giving some degree of sealing properties and adhesion on to the finish coat. The right primer can mean added years of useful service to your project. Priming interior trim and wood finish areas can result in greater coverage and smoother end-result when the primer is properly sanded before the application of the finish coat. Patching of the walls is crucial to achieve a smooth finish. There are a variety of drywall patching techniques to suit the particular application and a list of drywall repair tips for preparing the walls and ceiling repair for up above. Not to be overlooked. 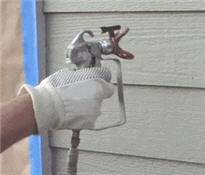 However these patches and repairs need not always be done by the painting professional. If you must paint an area that is subject to damage, spots should be addressed for the patching a large hole or if there is more severe damage, the patch of many holes is an absolute must, planning for the fact that dry times will be needed prior to application of primers and finish coats. Again, not always performed by the house painter. Look for siliconized caulk to be used, and not 100% silicone for paintable surfaces since paint will bead off pure silicone. For exteriors, caulking helps keep weather and moisture out and from penetrating where it shouldn't. Depending on local climate, get a recommendation on the sheen. Higher glosses can extend the life of finish while preserving the surface. Though keep in mind too that the higher sheens generally don't cover as well and can mean that an extra coat be applied by the contractor.